Our utmost wish is to be able to offer every visitor an event or activity he might enjoy. 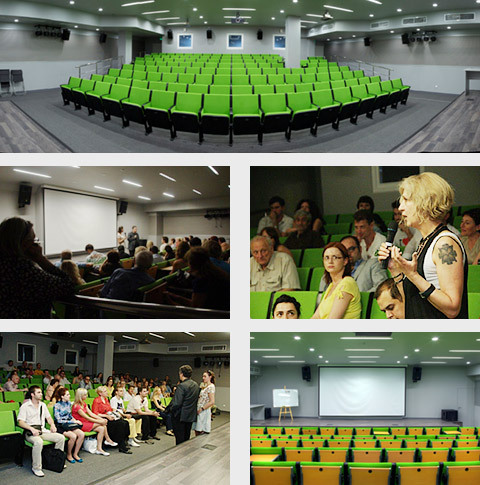 After the museum's reconstruction an auditorium and a video hall were added to the building. We hope that the programs we put together there are interesting to a wide range of visitors. Ever since we moved in in 2010 we held workshops and seminars with several world-renowned photographers: Jurgen Teller, Isabel Muños, Ed Kashi, Alberto Garcia-Alix, Agnès de Gouvion Saint-Cyr, there were programs for both children and adults. Every Photo Bienalle and Fashion and Style in Photography festival we invite the headliners to meet with the visitors. Last time our guests met Hilla Becher, Anthony Suau and others. We plan to continue to improve our programs and are always open to suggestions.